Problem: Heat stress can decrease milk production, dry matter intake, conception rates and milk components while increasing somatic cell count and laminitis. 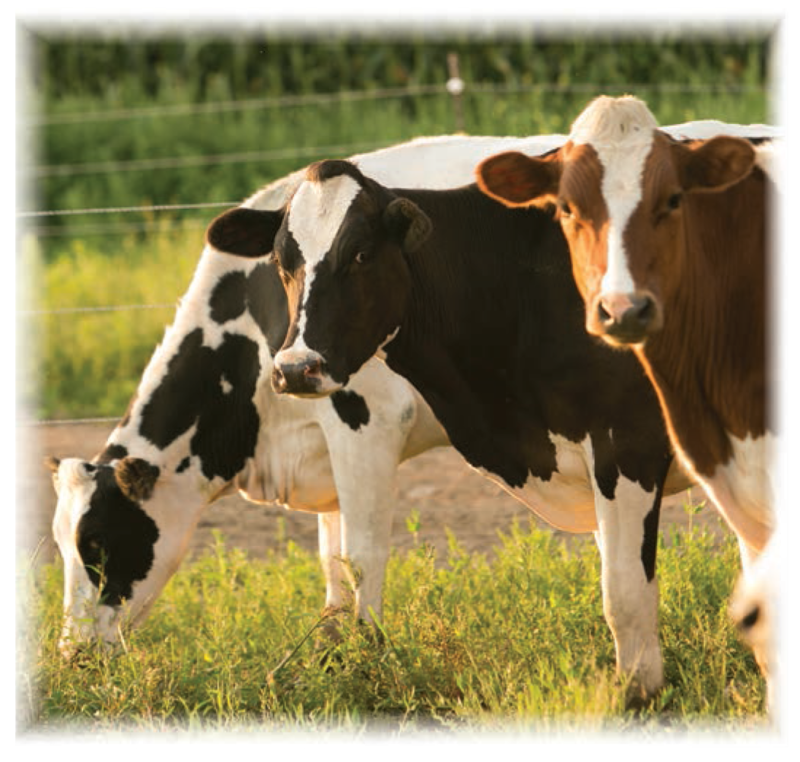 Dairy cattle begin to show symptoms of heat stress at 68˚F. Higher producing animals can exhibit signs of heat stress at even lower temperatures. When animals are heat stressed, the pancreas shuts down and the animals become less sensitive to insulin. As a result, these animals struggle to maintain energy levels and milk production suffers. Solution: Proper nutrition is a significant tool that can help reduce the effects of heat stress. Work with your nutritionist to have proper sugars levels in the ration to help maximize rumen function. Focus on bunk management (push up feed several times a day and feed during cooler parts of the day). Add Crystal Pellets™ to the diet at 2 to 4 oz/head/day to maintain feed intake. Provide adequate shade and have plenty of fresh, clean water readily available to all animals. Keep the barn properly ventilated and utilize misters, sprayers and fans while avoiding overcrowding. Problem: Cows that freshen during or after periods of hot weather are more susceptible to ketosis (a buildup of ketones in a cow’s bloodstream as a result of either a carbohydrate deficiency or an inadequate carbohydrate metabolism) and other transition problems. Ketosis, compounded with heat stress, can greatly reduce milk production and profitability for that cow’s lactation. Solution: Feed a balanced ration. Work with your nutritionist to make sure you have a balanced ration for your far-off dry cows, close-up dry cows, fresh cows and the rest of the lactating herd. Keep a watchful eye on cows close to freshening as well as the cows that have freshened within the last four weeks. Many producers test fresh cows for ketosis each week using the Precision Xtra meter for up to four weeks post-fresh. If a cow tests positive for ketosis, there are Crystal Creek® products that can be utilized to help treat cows (i.e. Super Boost™ and Cow Quench™ ). Utilizing Crystal Creek®’s Transition Cow Protocol at time of freshening will help to prevent problems during the transition. Problem: Summer heat can increase the amount of spoiled feed in the bunk and decrease feed intake. Reduction in feed intake can lead to ketosis and subsequent production loss. Solution: Feed animals during the cooler part of the day. Push feed up more often to help prevent spoilage at the bunk. Using a quality inoculant on your forages can also help improve bunk life (see Feed Preservation heading in this article for information on Crystal Creek®’s Inoc-U-Lock™ ). Add Crystal Pellets™ to the diet at 2 to 4 oz./head/day to help maintain feed intake levels. Work with your nutritionist to keep the ration balanced and maintain proper sugar levels in the diet. Problem: Flies spread disease and decrease production. Two diseases that can be detrimental to livestock are pinkeye and staph aureus mastitis. One way pinkeye is spread from one animal to another is by flies feeding on the secretions from the eyes of cattle with the disease. Fly bites on the udder from an insect carrying the staph aureus bacteria can infect heifers at a young age. Heavy fly pressure will also cause animals to become stressed and results in decreased production. Solution: One of the best ways to control flies is to use a fly repellent. Our fly repellent comes in two formulas. One is a water-based formula that mixes with water. The other formula is oil-based and should be mixed with mineral oil. The water-based formula can be mixed at a ratio of 1 part fly repellent to 3 parts water and used in a hand sprayer. The oil-based formula has more flexibility in use. Fly repellent oil-based can be used in hand sprayers, oilers, and wickers. Use the same 1:3 ratio for the hand sprayer but the oilers/wickers can be mixed 1:9. Other fly control methods include: Daily removal of old feed, proper manure management, fly tapes, fly traps and good ventilation. Using a combination of methods can give the best results to help reduce flies on your farm. Problem: Improper fermentation of ensiled feeds can lead to high amounts of dry matter loss, protein degradation, reduced feed quality, and lowered bunk life. Solution: Use a high performance inoculant, such as Crystal Creek® Inoc-U-Lock™ . Inoc-u-Lock™ contains 5 bacteria and 4 enzymes to help control each step in the fermentation process. Controlling the fermentation process in this manner, from start to finish, helps to preserve feed quality, retain dry matter, reduce protein degradation, improve bunk face and bunk life and ultimately improves your profitability. Inoc-U-Lock™ comes in both dry and water soluble forms that you can use on corn silage, haylage, balage and high moisture shell corn. Independent research shows a strong economic return on investment. Don’t let these summer challenges reduce your production and profitability. Call Crystal Creek® to consult with our knowledgeable staff to keep your herd on track during this summer season.